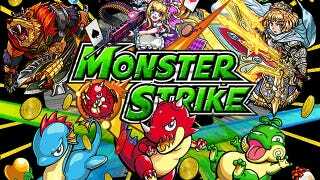 Monster Strike is one of Japan’s biggest mobile games—currently raking in $3.7 million per day. And since I’ve already covered no less than two of its clones, let’s take a look at the original. Like the Danganronpa and Tokyo Ghoul smartphone games, Monster Strike is based on the game of billards—where you bounce balls on a pocketless pool table into other balls. However in Monster Strike, it’s not balls you hit but rather monsters that you touch and subsequently slingshot into one another. Whenever one of your monsters collides with an enemy monster on the field, your monster does damage based on its stats and elemental properties. If it does enough damage to kill the enemy monster, said enemy monster is removed from the field. Of course, you can hit your own monsters as well. Doing so often unleashes powerful attacks that can be far more beneficial than ramming an enemy monster directly. There are also power-ups scattered across the levels that do various things like increase the damage you do or the distance your monsters move before stopping. The enemy monsters, on the other hand, don’t bounce around. Instead, they fight with attacks more commonly seen in bullet hell games than in free-to-play mobile titles. And unlike the enemies, your team shares a life bar. So when an enemy hits several team members with one bullet-spamming attack, it’s possible for your team to get wiped out. Regardless, take out all the enemy monsters and you clear the wave—and, when you eventually kill the boss, you’ll clear the stage and collect your loot. Your loot comes in the form of new monsters, cash, jewels, and orbs. The new monsters you can add to your party—or they can be sacrificed along with some cash to make another monster stronger. The jewels are also used to power up your monsters. The orbs, on the other hand, can be saved up to buy random rare monsters. (And of course those orbs can be bought for real world money as well). One aspect that sets the game apart from its clones is the up to four-person coop multiplayer. It’s more than a little fun to sit down with your friends and blow through a few missions together—and partnering up with three random strangers online isn’t half bad either. As you’d probably expect, the game is quite addictive—always letting you have a monster that’s just a tad better or stringing you along with the promise of another free jewel. In other words, it’s the perfect time killer. Monster Strike is currently available on iOS and Android.